Les Blog » Free Vinyard! Yes! it says free vinyard! Sounds too good to be true? Well friend, your right to be suspicious but this here is the real thing! Decide for yourself based on these easy-to-understand facts. 1) My mother is ready to live somewhere that is not next door to her other daughter in law. 2) Suddenly the pacific northwest looks pretty good. 3) Prefers country and views. Conclusion: With a little “help” making the right decision my dear, sweet, kind mother might end up owning land near Portland that will support viticulture. I know it sounds crazy but thats how great things usually begin. So here’s the plan: I feed her info and pix about great places she could live that, coincidentally, might suit other purposes as well. What I need: information about where grapes are succeeding within two hours or less of our burg. Example: I know that syrah is working out near White Salmon. I’ll go there and check out the area, then send a glowing report to esteemed mother. Washington side preferred for tax purposes and dry country won’t do for reasons of taste. I doubt this would be bigger than hobby size, an acre or two perhaps. But think of the fun trading in the easy purchace of grapes for year round back-breaking labor! WOW! Send me your ideas now! Eeee-teresting! Let the historic Wehn Farm in Norway be reborn! I keep hearing better and better things about Lyle, Washington. I remember a few years back, Caitlin told me about teaching kids from there, and how it was a pretty depressed community. But more recently, tourism seems to have upped the ante a bit, most obviously by the Lyle Hotel, which seems to get universally rave reviews. Could be a sign that Lyle is turning the corner into becoming a livable town. If that’s true, then I’d be curious about land up the Klicktat River, which empties into the Columbia at the western edge of Lyle. It seems like the big fight in this part of the Gorge is wind, which can desiccate fruit and complicate pollination – so the trick, perhaps, is to find a spot out of the winds shooting west along the Columbia. From the map at right, I wonder about the ravines heading east out of Wide Sky, Knight and Dillacort Canyons. All have southern exposures, but they’re close to water for irrigation (if necessary), and in particular Wide Sky, the east wind looks like it could be blunted by curvy canyons. Hard to tell what the altitudes are, but could be some nice views and some nice growing conditions. The only winery from this area which produces wines of any particular acclaim (so far) is Syncline, in Bingen. Looks like they don’t get their vineyard designated syrah locally (source vineyards appear to be closer to Maryhill and farther east), but they have planted syrah (in addition to Viognier, Grenache, Mourvedre, Roussanne, Cinsault, Counoise – yum) in their estate vineyard, which they call “Steep Creek Ranch.” It’s hard to divine where exactly this vineyard is, but they say it’s “on a southern slope on the very eastern edge of the new Columbia Gorge AVA.” According to the very rough Columbia Gorge AVA map (PDF version here), that would put it – hmmm – just north of Lyle. Anyway, perhaps the folks at Syncline are worth a visit and a question or two? Road trip! Excellent. 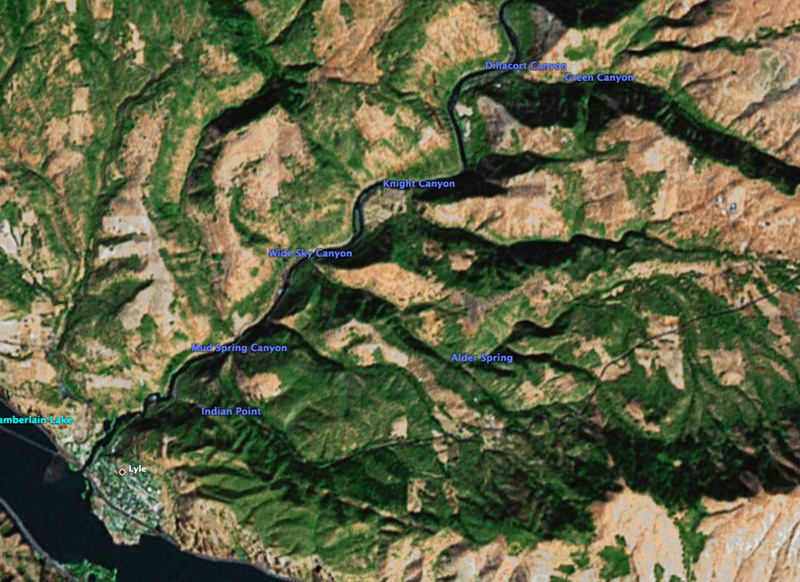 Varietals in the hood river area seem to be all over the map. It seems as though almost anything will mature. Dalles area might be to dry for the mother. But perhaps the canyon behind Lyle… I believe an information gathering boondoggle is required. Personally, I’m intrigued by the idea of white grapes (reisling? arneis? chenin blanc? s. blanc?) near the coast range. Oregon reisling was sort of popular with the rabble in in the 80s, forgotten about in the 90s, and now, with greater attention on international whites, more attention is being paid (and I’m betting will be paid) to interesting domestic whites. Property near Pinot Noir country, but higher elevation? Already well established vines? More of a bargain (till the hoity-toity come a-buyin’)? Close to Portland (and mom’s dear son)? Sauteed chantrelles from the backyard? Road trip indeed — this is an awesome possibility. I know a couple with a second home in that canyon behind Lyle, and can likely secure accommodations. What’s your mom’s timeline, George? Timeline is non-emergency, possibly three years. Enough time to prepare. Chanterelles and reisling? I salivate. Other Idea: getting ahead of the climate change curve. That is, planting grapes that will do well in twenty years when Olympia is the new Napa. (I didn’t make that up).